The Ion Age Blog: IAF016 Retained Post Delta and PIA001 Ylona of Prydia released! IAF016 Retained Post Delta and PIA001 Ylona of Prydia released! Bill Dalton checked the magazine on the Tumbler SMG for the third time. Sixteen rounds, just sixteen left. There would be no more ammunition and he had taken the last of it from the bleeding and now still body of his friend Numan. The pair of them, separated from their Planetary Militia platoon, had taken refuge in building after building gradually ending up now in a stock room in what once was a Happy Burger store. Numan had fallen with a laser bolt in his chest less than two minutes earlier. Dalton had dropped the Malig that had shot him with a burst of 9mm rounds. The pair of them had seen no Fabricator Spires along the way, well at least no spire that was functional, so resupplying had been impossible. They had picked up a few survivors of the Khanate assault on the Zone along the way; a woman with two small children. A heavy click announced that the Tumbler magazine with secure and with that Dalton took his eyes off the corridor that linked to the stock room and looked at the three survivors huddled in the corner as far as they could be from the door. Dalton was a big man, a powerfully built former ore miner who had come to the Camarthan sector to make a living. He had also signed up for the PM too thinking, rationally, that the extra florins an annum would be welcome in return for little effort. How wrong he had been and now he was in the depths of a hopeless situation. His arms shone with razzer tattoos, the thick muscles flexing changed the patterns as they moved. Dalton smiled at the cowering woman who clutched the children tightly. He could say nothing reassuring. They did not smile back. Footsteps in the corridor brought Dalton back to the present and he saw a pair of Maligs edging around the corner, their weapons jutting forward and plainly visible. Maligs were stupid but they were also bloody dangerous and cunning with it too. Dalton had learned that over the last three days. He pushed the nearby 'cleaning in progress' floor sign forward with his left foot and then kicked it hard at the Maligs. It skittered up the corridor with a scraping screech and had the desired effect. The two Maligs jumped in fright and in doing so fell into the corridor, their Maia Mpi's dropping to the rubbacrete floor tiles. Dalton took aim and blasted them apart with two pulls of the Tumbler's trigger. On the second pull the weapon roared and then thudded empty in his hand. He was now unarmed aside from a long knife at his waist, but at least the coast was clear for the moment. Dalton had been tricked. Maligs are nothing if not callous and expendable. The Shia Khan Legionary who had used the noise of their death to cover its approach above the flimsy ceiling units now dropped to the floor directly in front of him. It raised a Cupid laser pistol and Dalton barely managed to grip its arm in time and force the weapon sideways where it scored a line of burning holes in the wall. He drove a punch that would have given a prize fighter pain into the Legionaries mid section but either its auto aid or glimmer suit blocked the blow and the alien seemed hardly to notice. Bringing back his fist again the alien stuck him in the side with its gloved hand as Dalton hammered it in the face plate of its helmet. He was in pain now but all the force he could manage had cracked one of the eye pieces in the helm and the alien stepped back grunting. Dalton dropped the Tumbler and raised both fists. The Legionary however had not going backwards out of pain, it was just trying to bring its pistol up to kill all the Humans in the room. There was no way to see if the alien was smiling but Dalton, blood dripping from where the Legionary's spiked glove had cut his side, swore that it must be. It raised the laser pistol and brought it to point at his face. But before it could pull the trigger it fell forward, dead, as a booming echo of a heavy calibre round went around the small room. Behind the alien stood a Retained Knight in red and white powered armour an Angis 12.5mm AP Rifle in hand. Several more Retained were in the corridor and Dalton could hear more Angis fire nearby. Reaching to their neck seals the small group of Knights removed their helmets. As they did so their hair, released from the confines of their helms, fell to their shoulders. Dalton stood a good foot taller than the Retained in front of him but a grin broke across his face as wide as the horizon when he saw that they were all women. He knew that there were a lot of female knights but he had never seen one. Hell he had never seen any before now. The Knight that had saved his life spoke and then she returned the genuine smile. Dalton accepted the offer of more ammunition and taking it and the retrieved weapon he loaded the Tumbler and asked if his small group could accompany the Knights. Its been known for a month that this day was coming and now its is here! Yes, our forth Retained Post of ten brand new poses of 15mm white metal space knights but unlike the last three Post Delta is entirely female. Female Retained Knights for use in your Lances! IAF016 contains ten Retained in female pattern Alwite powered armour armed with a variety of weapons including Angis 12.5mm Rifles an Anvil 888 Launcher a Moth Type 12 Launcher a Minstrel Taser and a couple of Hermit Plasma Rifles too. All but two poses are without helmets so you can see their faces. Excellent on their own or for mixing into other Retained forces. As always this code can be bought as a pack or as single miniatures or select the three packs and save 10% option on the page. Go HERE. Price 5.00GBP per pack. 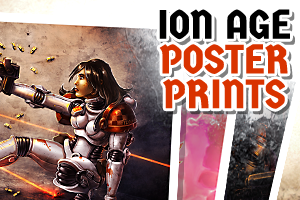 Another first for The Ion Age as we bring you the first poster print of our artwork! Back in the days of science fiction yonder poster prints were greatly desired and even now posters from films such as Bladerunner and Star Wars are on peoples walls taken from the cinema lobby's of the world. We wish to give this same feeling of looking at inspiring sci-fi artwork in a non-digital, tangible way to you with our own new Poster Prints. Printed on high grade 190gsm poster paper with rich inks here in Scotland each poster is just over A3 in format with a white border. 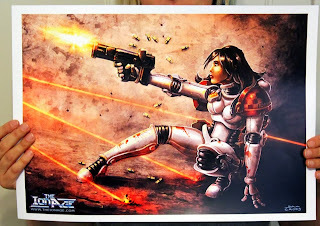 Perfect for your wargaming walls or office. PIA01 Ylona of Prydia was inspired by introducing female miniatures into The Ion Age and was created by Sam Croes. The Poster Print held by AJS! Each Poster Print is 5.00GBP and as always we offer a 10% discount for three purchased at the same time plus as a special treat you can get them signed by the artist too!. Go HERE. October is three weeks in now and its been a big month. So many IAF015 HabDomes, it is still affecting me, thanks again everyone. There is only a week left to get the second free monthly miniature IMP02 Retained Knight Powerfist by Eli Arndt before it vanishes forever, one free in every order. We do hope that you enjoy the new ladies and the poster print too. This week also saw the arrival of the whole, two hundred plus miniature, 28mm range of Ion Age miniatures to us from the Alternative Armies website so we are now complete! It feels great and we will be expanding the 28mm range soon. Remember when you place an order with us you will be promoted to join the loyalty scheme which will earn you Reward Points on all purchases which can, once accumulated, be redeemed for discounts and special miniatures. I'll be getting some of these lovely ladies I think! You will love them I am sure. Beautiful work. Nice to see some ladies on the sci-fi battlefields! Keep up the good work on your side of the pond, we really like your designs too. I am somewhat confused as to the Monthly Promo Figure. If I order 1 item (like the 3 Habs I ordered (they look great! )), I get 1 promo. But if I order 3 different items (3 different squads, for example), do I get one promo with each item, or one for the entire order? Thanks for your comment and interest in the monthly promo miniature. Thanks also for your Hab Dome order, enjoy them. The miniature that is free is supplied at the rate of one per order, regardless of the size of the order. So if you make one large order you get one, if you place three smaller orders in a row you will get three free miniatures in total across the orders. I hope this helps you out. But you also got the Noblesse which only a couple of hundred other IonFans have until next year.